“A driveway is a type of private road for local access to one or a small group of structures, and is owned and maintained by an individual or group. 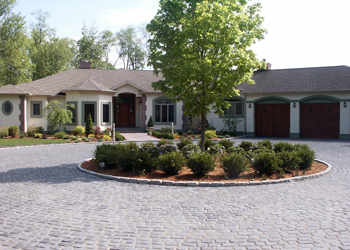 Driveways may be decorative in ways that public roads cannot, because of their lighter traffic and the willingness of owners to invest in their construction. They are generally designed to conform to the architecture of connected houses or other buildings. Some of the materials that can be used for driveways include concrete, decorative brick, cobblestone, block paving, asphalt, gravel, decomposed granite, and surrounded with grass or other ground-cover plants.